The perfect way to end summer is with bare feet in the sand, eating tasty food, drinking good wine and all for a good cause. That is what An Evening on the Beach is and that is why it is the Please The Palate pick of the week. The number of food and wine events that take place are numerous. And most of these events support worthwhile causes. But there are a few food and wine events that stand out above the others and one of them is An Evening on the Beach. After all, when you have your bare feet in the sand as you enjoy good food, good wine and good cocktails all for a good cause, then you have a night of good fun. And that is why this week’s Please The Palate pick of the week is the annual event An Evening on the Beach. As it still feels likes summer, An Evening on the Beach is the perfect event for a summer evening. 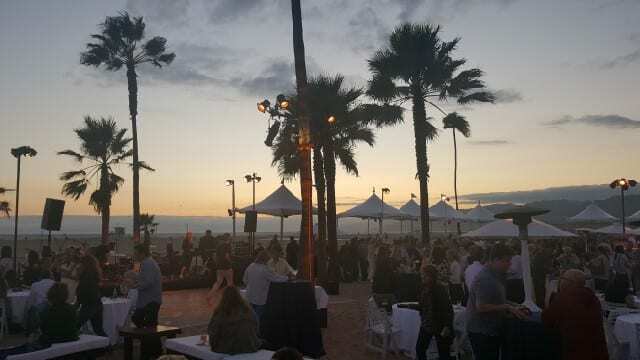 The 8th annual event returned to the Jonathan Beach Club in Santa Monica where two dozen restaurants, more than a dozen wineries and a handful of spirits were joined by 700 guests, everyone with their feet in the sand.